Verizon Tech Support Confirms Froyo for Incredible and Droid in Early August? Update: I should have been more clear with this. This is indeed just a rumor and should be taken as such. 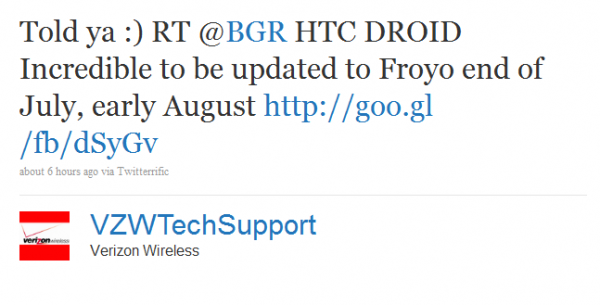 An unofficial Verizon Tech Support Twitter account basically confirmed today that the delay of the OTA update for the Droid Incredible is because Android 2.2 will now be included. Yes, “unofficial,” meaning they admitted to being official tech reps, just not ones endorsed by corporate VZW. Even so, we’re guessing they still have a pretty good inside track as to update statuses. Awesome. Early August is 13 days away. Countdown time!